Visitors must make arrangements with the Station Manager for the combination to open a locked gate 200-yards off of Hwy-89 (map). The facility has 22 wooden buildings, concentrated in a stream-side footprint within the larger 9,000-acre Sagehen Experimental Forest. Sagehen Creek Field Station operates 24-hours a day, 365-days a year, with most use occurring during the summer/fall field season between mid-May to mid-October. Summer, 2015 brought our busiest day ever: 135 people participating in 6 different events. There were no conflicts; Sagehen easily accommodates multiple overlapping users and groups. 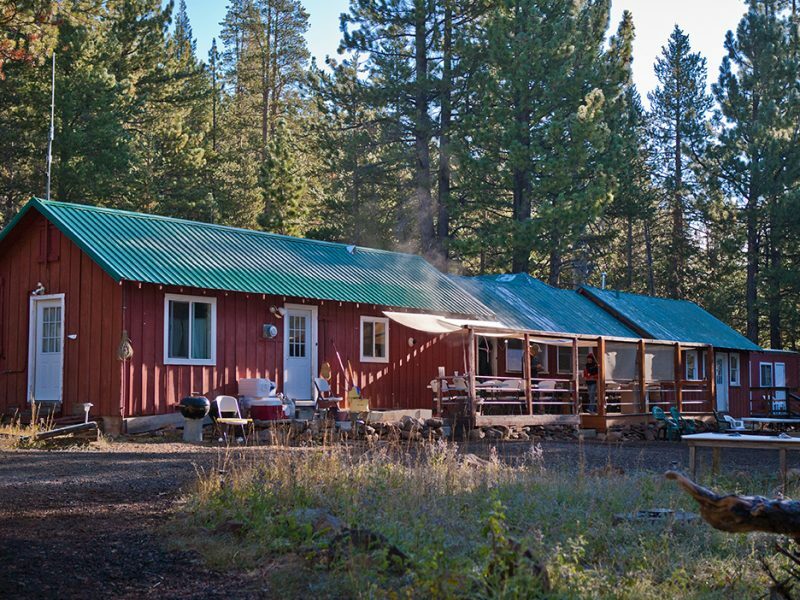 Station facilities include 69 year-round, bunkhouse-style beds, a communal kitchen & bathhouses. There are 2 small indoor meeting/class rooms, a large covered outdoor meeting/class area, a dry lab, and limited office spaces. All sleeping areas & most buildings are fully winterized & have seasonal propane heat from roughly November-May (there is no heat for the rest of the year). Beds are twin size with the exception of limited faculty space with full or queen size. There are also up to 20 tent-camping spaces available within the station’s designated camping zones. Days can be hot and nights can be cold, even in summer, so plan accordingly. The 1.8 mi. entrance road is unpaved. Low-clearance vehicle access is usually not a problem during summer & fall. Winter & spring snow is removed by a snow-cat, allowing all vehicle access to Sagehen between roughly November to May. High-clearance is helpful, though not mandatory, and all travelers should have snow tires and chains while traveling in the Tahoe area during winter months. 2.6 on-site UC Berkeley employees staff the station. Self-funded Sagehen programs employed an additional 3 FTEs, 6 seasonal employees, and over 30 volunteers in 2015. 174 volunteers have contributed biotic observations in the basin since 2012. Over 180 volunteers from Northstar resort’s Epic Promise program painted our cabins, and helped with other projects over two days in 2017. Station use fees do not come close to covering the cost of operating the facility. Sagehen has no housekeeping staff, and visitors are expected to leave the facilities cleaner than they found them. There are hotels in Truckee, if you prefer. Chemistry lab space and/or services in the Tahoe area may be negotiated through the Tahoe Environmental Research Center (TERC) in Incline Village, NV (talk to us). Sagehen facilities include extensive environmental monitoring sites throughout the Experimental Forest. Our Google Map includes precise locations of sensing & data collection sites in basin. Use the forward links at the bottom of the page to see more pages of features. Use the “View in Google Earth” tab to export a .KMZ file for more control over display options. The map also includes road directions to station, geographic landmarks & logistical features like gates, culverts, etc. See our other Google Map for bike routes & local services regularly needed by station visitors.